If you’re strictly interested in monitoring your cat’s activity when you’re away from home, a standard home security camera will do the job. Pet-specific home cameras add fun and bonding into the equation, allowing you to engage with your cat. 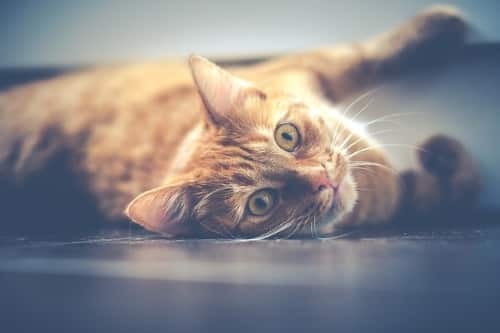 If you find yourself longing to Facetime your cat during the workday, toss them a treat when you’re stuck in traffic, or tease them with a laser pointer while waiting in line at the pharmacy, a cat camera can give you that remote connection with your cat. A word of warning if your main motivation for buying a cat camera is the ability to give your cat dinner while you’re chained to an office chair: you’ll get more remote feeding options out of an automatic feeder. Here’s how we chose the best cat cameras on the market. HD video was a necessity. Some cat cameras emphasize fun pet-focused features but lack practical strength. Remember that you’re not paying for this camera in cat treats—cat cameras retail from $150 to over $300. There’s no reason why you should accept video quality any lower than what you’d expect out of a video call with your human friends. When choosing the best cat cameras for this list, I scratched out anything offering less than 720p HD video and preferred those with 1080p full HD. Cat cameras must smoothly integrate with top operating systems. Cat cameras connect to your home WiFi and stream to a connected mobile device. We’re looking for beautiful, intelligent phone apps that work with both iOS and Android operating systems. There shouldn’t be connectivity issues or excessive lag. Interactive features earned extra points. Each cat camera has strengths and weaknesses, so it’s important to make sure that your camera’s strong points align with your cat’s personality. Interactive cat cameras have microphones, speakers, laser pointers, and some deposit treats. 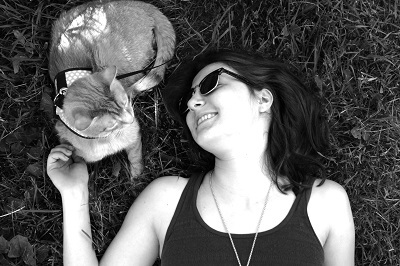 Determine which, if any, of these features will excite your cat and shop accordingly. Think about the rest of your fur family, too. If your cat shares the home with a couple of pups, the cat camera should offer something fun for them, too. If your cat is food-motivated and clamors for treats throughout the day, they’ll appreciate a treat dispenser. The best food dispensers are easy to fill and clean and allow you to both schedule an automatic treat time and manually trigger a snack. Most cat cameras allow you to communicate with your cat by voice, but not all of them have a microphone that lets you hear your cat and other household noises. Two-way audio functionality is valuable and a quality of the best cat cameras. If your cat loves to play, these integrations will give them entertainment when you’re away from home. The most common play integration is a laser pointer, but some cat cameras connect to other remote-controlled toys for a diverse play experience. While most cat cameras are relatively obtrusive and might elicit questions from guests, the Petcube Play is a small, subtle 3” cube. It’s available in carbon black, rose gold, or matte silver colors. Video is transmitted in 1080p full HD with a viewing area of 138°. If you want to get a closer look at your cat, you can use the Petcube’s 3x zoom feature. If you’re away from home at night, the camera’s night vision capability will allow you to view your cat in the darkness. Video recordings are triggered by sound and motion. Your purchase will give you the last 4 hours of activity, but if you’d like to view a multi-day recording history, you’ll need to opt in to a Petcube Care subscription. The Petcube’s interactive features are limited to 2-way voice communication and a laser pointer you control from your smartphone. This feature allows you to play with your cat from your cubicle or anywhere else with an internet connection. If you’re unable to make it to remote playtime, you can schedule autoplay sessions. While some other cameras have angled laser pointers, the Petcube directs the beam directly out, meaning that it’s more likely to strike a wall than the floor. While most interactive cat cameras offer either laser pointer entertainment or treats, the Pawbo does both. Note that this camera doesn’t shoot treats across the room. Instead, it rotates to drop treats straight down. No projectile element means that treats could land on a bookshelf or coffee table, so it’s important to think about placement. There is also a wall mounting option, which is a good choice if your cat has a tendency to knock objects over. 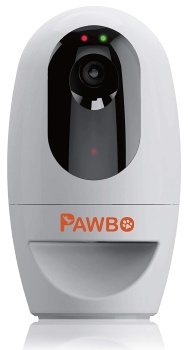 The Pawbo Pet Cam is compatible with a variety of accessories. If you get multiple toys, you’ll have what the company calls a “Pawbo Theme Park”. Video quality is the Pawbo’s biggest shortcoming. While other cameras offer 1080p full HD video, this camera streams and records in just 720p. It’s still considered high-definition, but it’s not the best you can get. Note, also, that the Pawbo camera doesn’t record in night vision, meaning that you and your cat will be left in the dark at night. 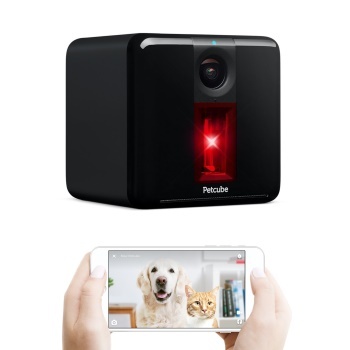 While the Petcube Play combines a monitoring camera with a laser pointer for remote play, the Bites model focuses on treats and rewards. 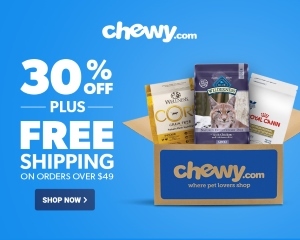 The slightly larger unit has a full-size treat hopper for minimal refilling and costs about $60 more than the Petcube Play. It has a sleek rectangular design and is available in three colors: matte silver, carbon black, and rose gold. The device can be placed on a tabletop or shelf or mounted on the wall. The Petcube Bite streams and records in 1080p full HD and has a 138° wide angle view. The 3x zoom allows you get a closer look at your cat. And when the lights go out, you don’t have to be in the dark. The camera’s high-quality night vision allows you to see your cat clearly. Anytime sound or motion is detected, the Petcube will send an alert to your phone and prompt you to view the feed. You can save triggered videos on your timeline, and if you want to view more than the last 4 hours of your cat’s activity, you can opt into Petcube Care to access up to 30 days of video history in the Petcube cloud. Two-way audio allows you to both speak to and listen to your cat. 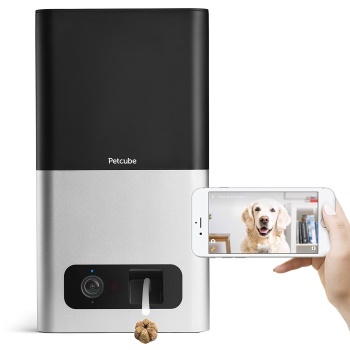 From the Petcube app, you can remotely fling treats at varying distances. Scheduled treat tosses allow you to automatically give your cat treats at planned times during the day. Although it’s not made specifically for pets, this sleek home security system provides assurance that your cat is safe while you’re away from the house. The Canary has a 1080p HD camera with a 147° wide-angle lens. The camera has night vision, so you can watch your cat at any time of day. The device sends activity notifications and human detection alerts to your smartphone, so you’ll know when your cat is getting into mischief or there’s an intruder in the house. If you see or hear something that makes you nervous, Canary offers one-touch access to emergency responders and features a 90 dB siren that you can trigger with a touch. The Canary monitors temperature, humidity, and air quality, helping to ensure that your cat’s home conditions are just right. If you add on a $10/month membership subscription, you’ll get 30 days of full-length video history, two-way communication, and the ability to add unlimited Canary monitors to your account. Alexa users will appreciate that the Canary is compatible with Alexa voice control.